Mellor Coachcraft has had an amazing year. 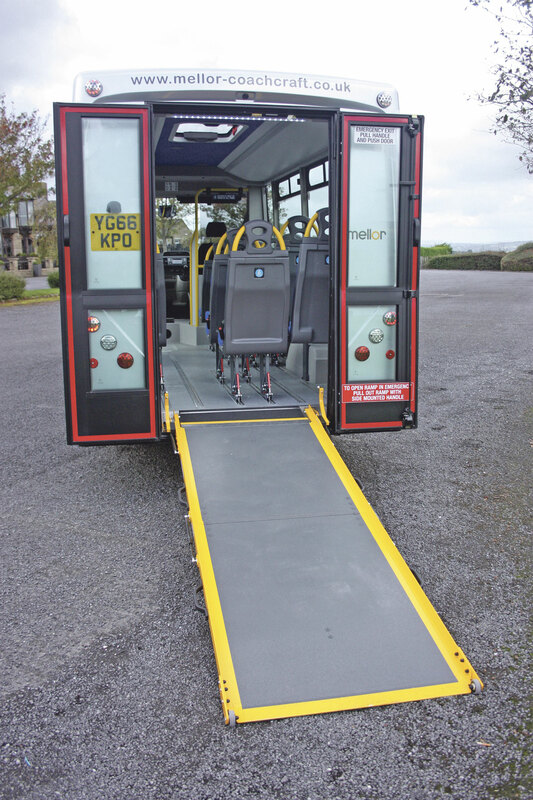 It started by building on the previous year’s work of introducing 100% fully engineered and productionised standards to its Orion range of up to 22 passenger low floor directly wheelchair accessible minibuses, particularly the increasingly popular service bus version. Then they introduced the Maxima, a high capacity minibus based on the Iveco New Daily and quickly followed that up with the new Mercedes-Benz Sprinter based low floor directly wheelchair accessible minibus the Strata LF. Both the Maxima and the Strata LF, particularly the service bus version of the latter, have proved popular whilst Orion sales are running well ahead of schedule. 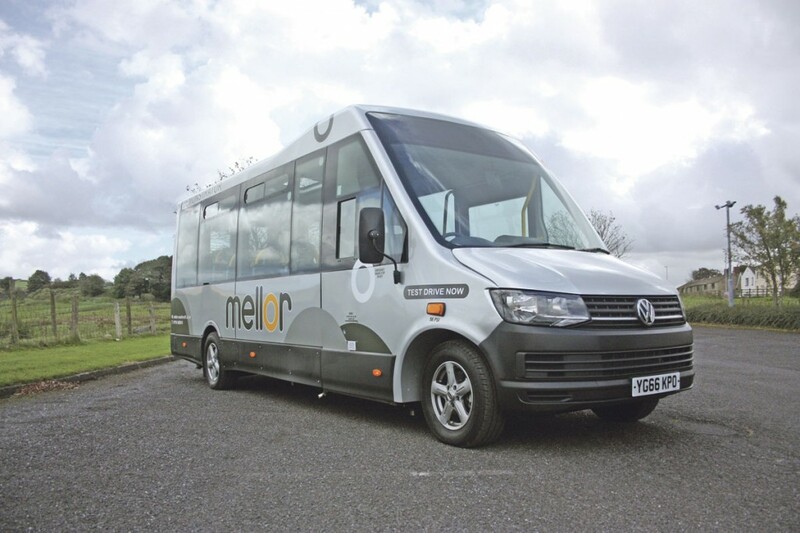 Now Mellor has turned its attention to the market for smaller vehicles with the announcement of a completely new directly wheelchair accessible minibus, the Tucana II. The new Tucana II is just that, new. There is very little carry over from the previous Tucana except in design concept and certain componentry. Whilst we will spend most of this article looking at the new model, we do need to reflect on its predecessor. The original Tucana was Bluebird Vehicles first truly new design. I remember visiting the company in Scarborough in 2004 and meeting John Randerson who was involved in the design of that vehicle. In fact on the day I visited, John was personally overseeing the sculpting of the front end of the vehicle on the original mock-up. No one knows more about Tucana than John Randerson. He has lived with the vehicle since its conception and nowadays, as the General Manager at Mellor Coachcraft (who bought the Bluebird designs a few years ago), he has, with his team, been totally responsible for the design and development of the new Tucana II. Mellor has built a few Tucanas since it took over but by far the bulk were built by Bluebird, primarily because by the time Mellor got into its stride integrating the former Bluebird designs, the VW T45 Transporter was already on its run-out ahead of the introduction of the up-coming T6, so the special VW front ends used by Mellor were in short supply. The original vehicle was introduced at the now defunct CTA annual show at Manchester in 2005 and immediately proved popular. The figures are impressive by any standards; over 650 were built including a number for export, especially to Malta. The largest single customer was Transport for London who took over 250, the vast majority of which are still operating. The basis of the Tucana was to use a VW Transporter T45 front wheel drive unit and marry that to a bespoke design of lightweight chassis fitted with trailing link suspension. 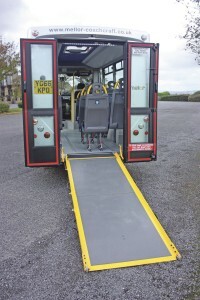 This is what gave it its remarkably low side entrance step height and flat saloon floor enabling direct unassisted wheelchair passenger access. The company built Tucana’s with wheelchair access either directly unassisted from the side or by assistance at the rear, using a shallow fold out ramp or built them in service bus form with a coach type solid rear panel and no ramp. Those design principles are firmly embraced in the new Tucana II but it is also a very different vehicle and looks like one. Mellor have continued faith with the VW front end which over the years has proved to be outstandingly reliable and economical. But of course the VW T45 Transporter is no more, having been replaced by the new T6 version. This is significantly different, particularly in the area of the engine, which is a new Euro6 unit. There are also revised transmissions, revised front suspension, improved cab standards and trim. The new engine in the T6 is a major development. It is a 2.0 litre four cylinder common rail, fuel injected, turbocharged diesel with very sophisticated and advanced combustion principles that makes the engine not only powerful, but also very economical because the new combustion system ensures the maximum use is made of the available fuel and it is fully combusted. This is important as part of pollution control. Achieving Euro6 emission standards is also helped by the use of AdBlue. In the VW Transporter the engine is available at a number of power settings including a 204bhp version. But such power is not necessary for the Tucana. 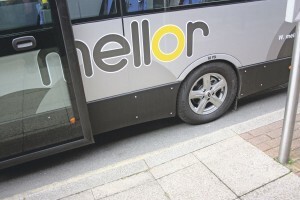 Mellor have chosen to use the 140bhp unit which develops that degree of power across a 3250 to 3750 rpm speed range. Arguably the torque output is more important because it is the torque that does all the work. The 140bhp engine develops a maximum torque figure of 340Nm which is available across a wide speed range from 1750 to 2000 rpm. To match the engine improvements, the T6 also has new or revised transmissions. First of all, the six speed synchromesh manual transmission has been upgraded primarily to deal with the new engine’s power and torque characteristics but also to promote even smoother gear changing. The fully automatic transmission has also undergone major change and is now the renowned DSG seven speed fully automatic unit. The engine and transmission are mounted transversely at the front of the vehicle and inclined by eight degrees. The front suspension remains the excellent independent system used on the T45 Transporter but again it has been tweaked and upgraded for even better ride, roadholding and reliability. Steering is powered. Braking uses discs all round. The vehicle has a 90 litre fuel tank mounted on the offside and a 13 litre AdBlue tank located under the bonnet. Moving onto the pure Mellor part of the vehicle (80% of it), this starts with the saloon chassis and rear suspension. The chassis is similar in construction methodology to the previous Tucana but is quite different from the previous vehicle. The cranked floor plan has disappeared reducing front step height even further and allowing greater flexibility in the positioning of removable seats. Improvements have also been made to rear suspension mounts and the wheelarch boxes reduced to free up space internally. As with all new Mellor products, all components on the vehicle are to the company’s new standard which demands that any component fitted to its vehicles is fully engineered and repeatable. The consistent use of CAD CAM systems across the Mellor range and the use of modern composite materials is of huge benefit when manufacturing modern low floor vehicles. This philosophy is now standard Mellor practice. Today’s Mellor Orion, Maxima and Strata LF all benefit from the use of these systems and advanced composites. Their great advantage is weight saving without strength, corrosion and reliability compromises. The trailing link rear suspension is essentially the same as previously although updated and tweaked. There is a choice available of air suspension or coil springs. Air suspension is generally specified for vehicles with a rear loading ramp because its ability to be lowered enables a very low rear step height/shallow ramp angle to be achieved. If the vehicle is to be used for side entrance wheelchair loading then coil springs are generally used because air suspension offers little advantage in this condition and operators generally prefer the simplicity of the coil spring option. The body framing for Tucana II benefits directly from the use of Chromweld steel throughout. This gives corrosion protection throughout the life of the vehicle without any loss of structural integrity. Keen eyed readers will have noticed a subtle difference between the frame of the new Tucana II and the old model. The previous Tucana had an A and an A1 pillar at the front end, the new Tucana II has only an A post. A major advantage of this change is to allow a larger driver’s signalling window to be fitted. 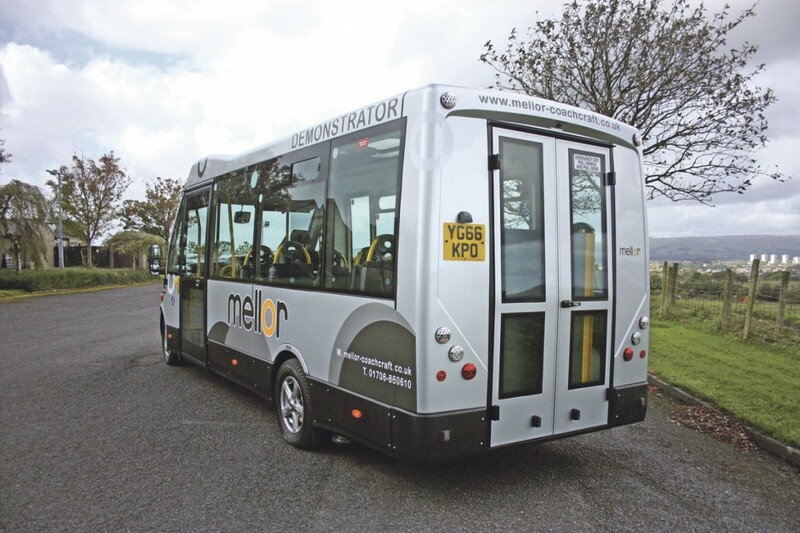 Styling of the front end is considerably revised and incorporates the characteristic aerodynamic sweep integrating the screen into the roof line which is now a feature of all Mellor products. The screen is a deep, wide, single unit giving outstanding vision for the driver. The design also allows for the fitment of destination equipment behind the screen avoiding the need for a separate housing. Cladding uses high quality re-inforced GRP mouldings. Of particular note is the one piece roof moulding which avoids joint leakage in later life through weakening joints. The overall vehicle is 7.012m long (slightly longer than the previous model), 2.080m wide and 2.565 high. It has a wheelbase of 4.3m, turning circle of 12.2m and a GVW of 4.1tonnes. The width is a key point in the design of the Tucana. There are many operators, particularly those operating in rural areas, for whom the compact dimensions of the Tucana II, especially its width, will be an attraction. 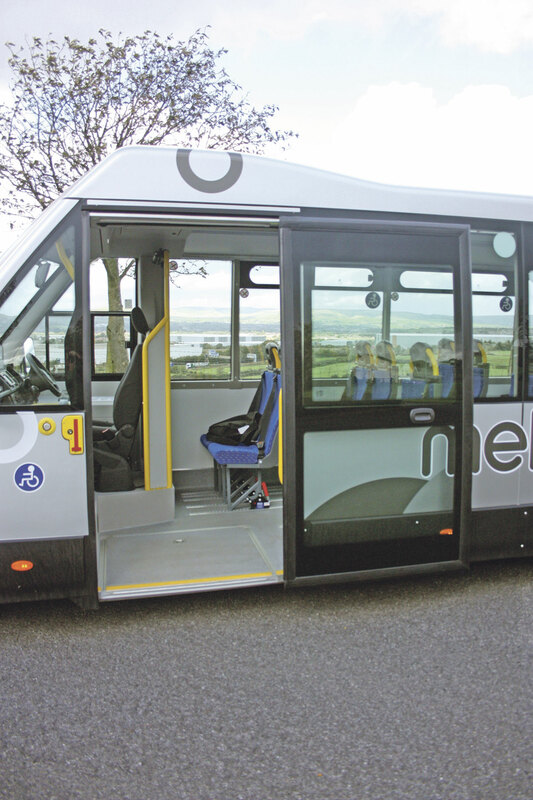 The wide front entrance also marks another significant change in that, rather than the previously used twin outward opening doors it uses Mellor’s now standard rapid closing Ventura one piece, soft closing, electric plug door. The step height is a mere 270mm. 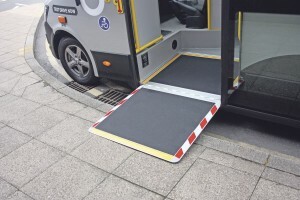 A manual ramp is also provided but against most kerbs would not be needed. With air suspension fitted, the step can be lowered even further if required. At the rear are full height, glazed doors which open outwards to fold flat against the rear of the vehicle. Where a coach type rear end is fitted then an emergency exit is incorporated at the rear on the offside. Within the saloon, the floor (another example of the use of composite materials) is flat front to back and fitted with floor covering and tracking layouts as required by the customer. 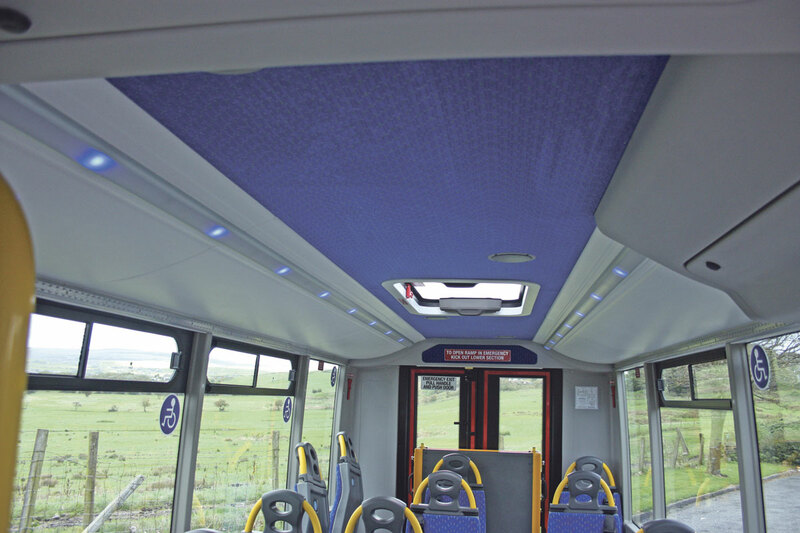 Internal trimming uses moulded GRP soft feel, easy clean materials in common with other recently introduced Mellor products. Glazing uses large bonded, tinted units, some with top opening sliders. There is also a glazed roof light/emergency hatch. Heating and ventilation is provided by either Eberspächer or Webasto units and a 12kW roof mounted air conditioning unit is also available. There is a choice of seating available using a mix of single normal seats set in pairs and singles alongside the gangway and tip and folds in the wheelchair area. 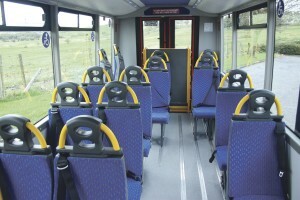 The conventional seats can be fitted with quick release fittings if required. 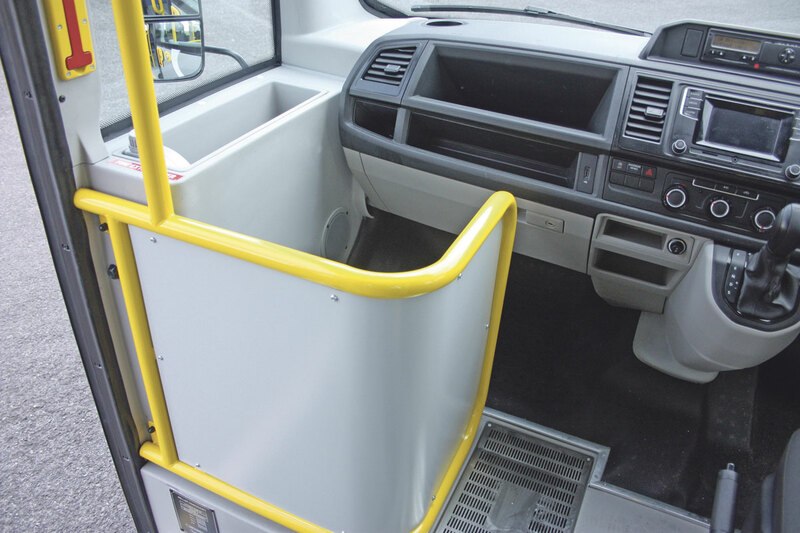 In the service bus version, a conventional rear facing wheelchair bay behind the driver can be provided, or up to three wheelchairs can be carried using conventional clamps and removing some seats. The version with the rear doors can carry 14 seated passengers or alternatively two seated passengers and four wheelchairs. The version with the coach type rear end can carry a maximum of 15 seated passengers or six seated passengers and three wheelchairs.. The cab beneath the screen is essentially standard Transporter and features well laid out instruments and ergonomic positioned controls. To this, Mellor have added on the driver’s right, a neat body system control panel and the reversing camera screen. The whole cab area is trimmed in similar GRP panelling to the remainder of the vehicle. On the driver’s left there is a large storage pocket and a luggage pen. The heating and ventilation is also ducted up into the cab through a grille on the floor. Other features are large electrically adjusted mirrors and a pull down driver’s sun blind. 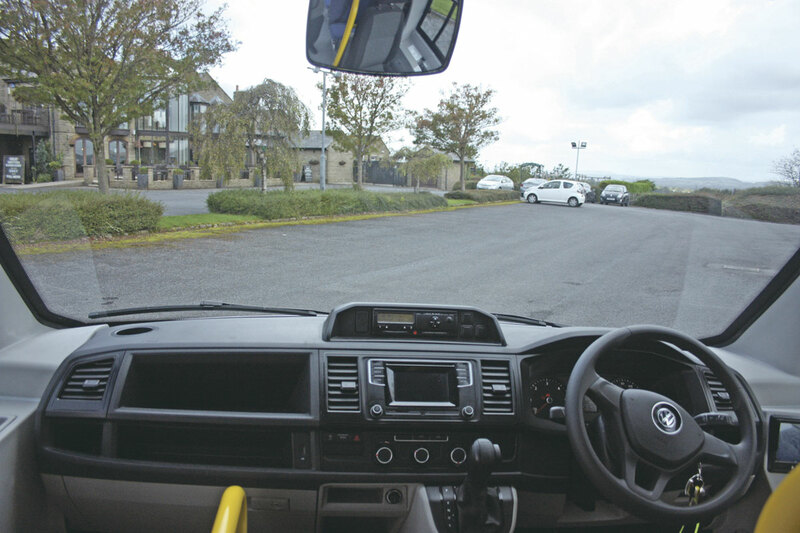 The vehicle is supplied with an entertainment system and sockets for USB devices and mobile phones. The first thing that strikes you when you sit in the driver’s seat is the excellent vision provided by the large screen. I also like the large rear view mirrors. Some people might find the reflection of the signalling window frame in the mirror a bit disconcerting but I can’t say I did, in fact after a few minutes I wasn’t conscious of it at all. Mellor can provide a slightly smaller mirror which avoids this reflection if required, but my preference is always large mirrors. Starting up the Tucana II you are immediately struck by how quiet the engine is. Moving out of Mellor’s tight and potentially hazardous yard, I found the vehicle to be highly manoeuvrable even at slow speed and the reversing camera was useful giving a good image behind the vehicle. Once away from Miall Street and tackling Rochdale’s inevitable and inexhaustible supply of speed humps, I found the Tucana to be beautifully docile, quietly threading itself through the packed side streets that surround Mellor’s base, with perfect precision. The steering is light, positive and accurate but with a nice degree of feel. Onto clearer roads, I was immediately impressed at the response. Plenty of power and torque all nicely translated into smooth forward progression. This was aided by the superb seven speed automatic transmission quietly and smoothly changing ratios almost imperceptibly. Once able to give the Tucana II its head, it rapidly moved up to cruising speed and did that without any excess noise or effort. Once there, it was happy to cruise along holding the road perfectly, riding smoothly and also very quietly. Braking, as I expected, was up to standard. Powerful, quick, safe and straight. I would never worry about the brakes in the event of an emergency stop, I think it would stand on its nose if you wanted it to but the passengers would not appreciate that! It was a pure joy to drive this beautifully balanced vehicle, be it on the open road or in the tight and congested environs of Rochdale. At all times the Tucana II went quietly about its business without fuss or effort. The standard of Mellor’s vehicle building is of the highest. I didn’t expect there to be any rattles or squeaks from the body or any shake or shimmer and there weren’t any. I was quite sorry when my test drive was over, I could have happily gone on driving it for hours. The first Tucana II has already gone into service and very fittingly this was with Scarborough Dial-a-Ride. They also operated the prototype original Tucana and have in fact only recently sold the vehicle after years of excellent service. Not surprisingly in view of where they are located, they had a long history of operating Bluebird designed vehicles and working with John. This included at one time operating the Tucana’s predecessor a Fiat Ducato based Migro. 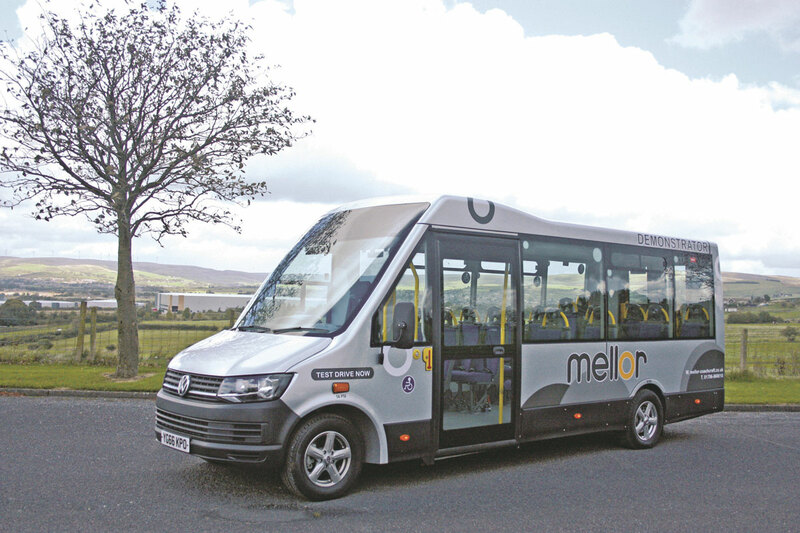 Mellor are now accepting orders for the new Tucana II and if you want to have a closer look at one, there will be one on show outside the main entrance to the NEC during next month’s Euro Bus Expo. I think this is an absolutely stunning vehicle. 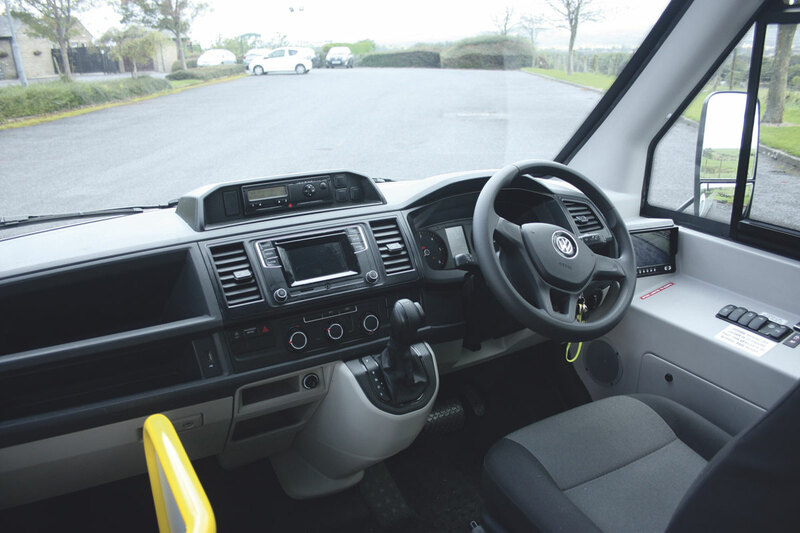 I’ve always had a soft spot for the Tucana, feeling it was in many ways the perfect small accessible minibus thanks to the combination of the excellent VW front end and the quality of the design and build of the body. Tucana II takes that to a whole new level. That this new model will prove equally as popular, I have no doubts.